Train Waiting and 3 Guests are viewing this topic. With the plaster bandage you just cut sections off the roll, dip it in a shallow water tray and lay it over the brown paper. It seems to take a day or two to dry fully. That might be the brown paper substrate retaining the moisture? Plaster bandage usually hardens and dries quite rapidly, remember it used to be used for setting broken arms etc.! And using warm water can help. More messy fun this morning! 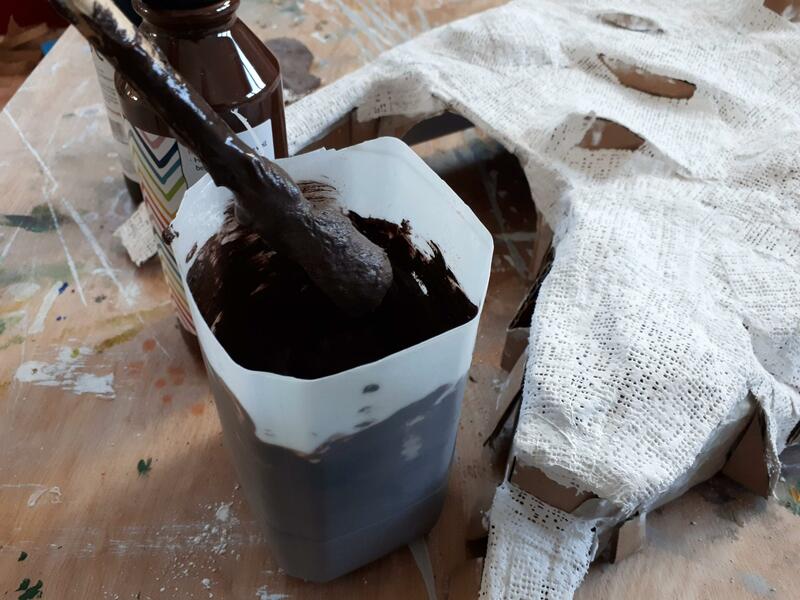 I've mixed up plaster of paris with the poster paint and smeared it onto the hill, covering up all the little gaps in the mesh of the plaster bandage. I mixed up too much at first, it starts to set surprisingly quickly in the mixing pot! In other news, I have made my ICE style tunnel portals with a £5 length of 10cm diameter air duct tubing from B&Q and a hack saw. These have been painted very light grey with Tamiya acrylics. I'm extremely chuffed with these! 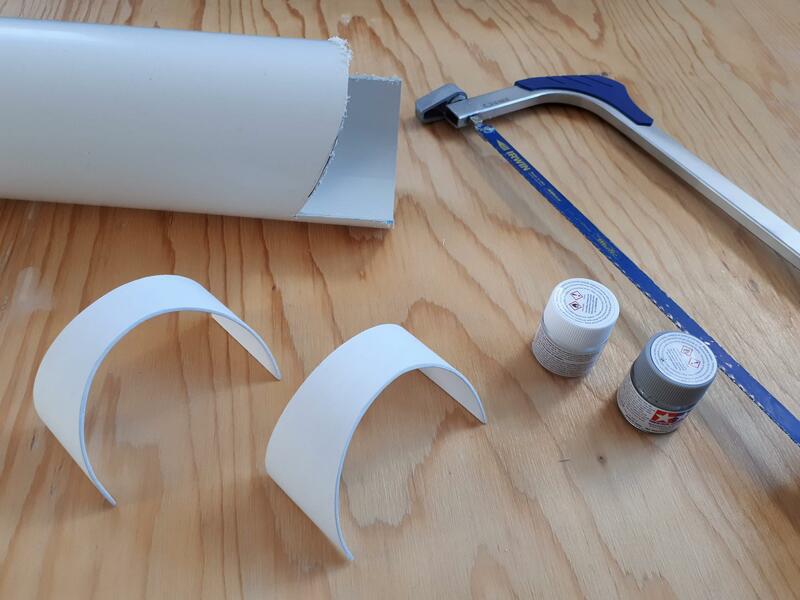 ............….In other news, I have made my ICE style tunnel portals with a £5 length of 10cm diameter air duct tubing from B&Q and a hack saw. These have been painted very light grey with Tamiya acrylics. I'm extremely chuffed with these! Much cheaper than the Busch ones. I know. I'm figuring I can't self-make locos, rolling stock or track (well, not without extreme difficulty), so I'm going to make as much of the other stuff as possible. My signal box was an inexpensive Kibri kit and I'll use that to scale my scratch built station building. And I'm sure you will make a great job of it. I find that building the layout is just as much fun as running the trains. Thank you, yes the building is rewarding! Here's my nearly finished signal box. I've painted it in my favoured colours with various mixes of Tamiya acrylics. I'll leave weathering it till it's in position in the landscaped layout. it was quite hard to get the correct brick tone - I mixed desert yellow, red and white in the end. I've replaced the kit glasing with thin, clear plastic cut from Fleishmann track packaging, as I found it easier to get a precise fit that way. Regarding the station, I will be going for a scratch build. I've changed the prototype now to a smaller building. 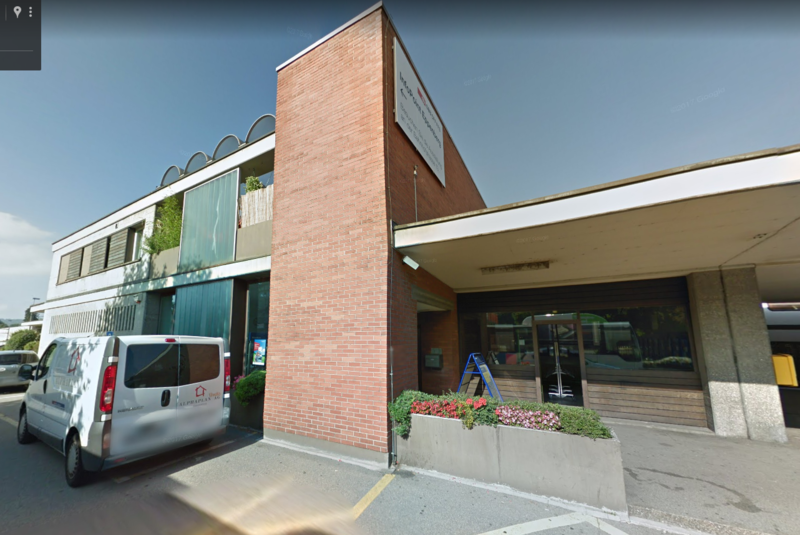 After a long trawl through Google satellite view, I've located a small, modern station outside Zurich. I've sent a relative who lives near there to go and take photos for me! Looking forward to the joys of scratch building for the first time! 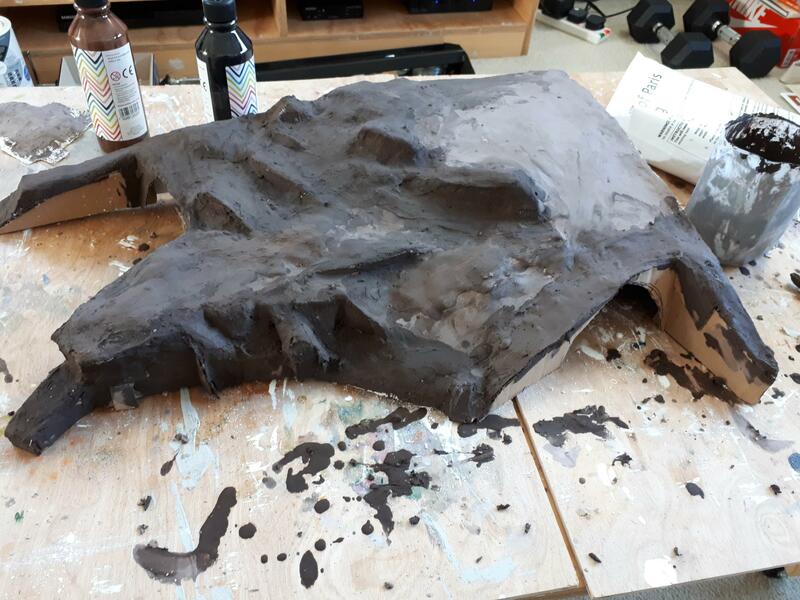 The plaster on the hill is now fully dry, I'm making a few tweaks and then I'll give an even coat of brown acrylic. Then I guess it's ready for the addition of some rock effects and final scenics. And finally, I'm getting through painting all the sleepers grey - this is taking quite a long time! Once that's done I can think about gluing the track down. 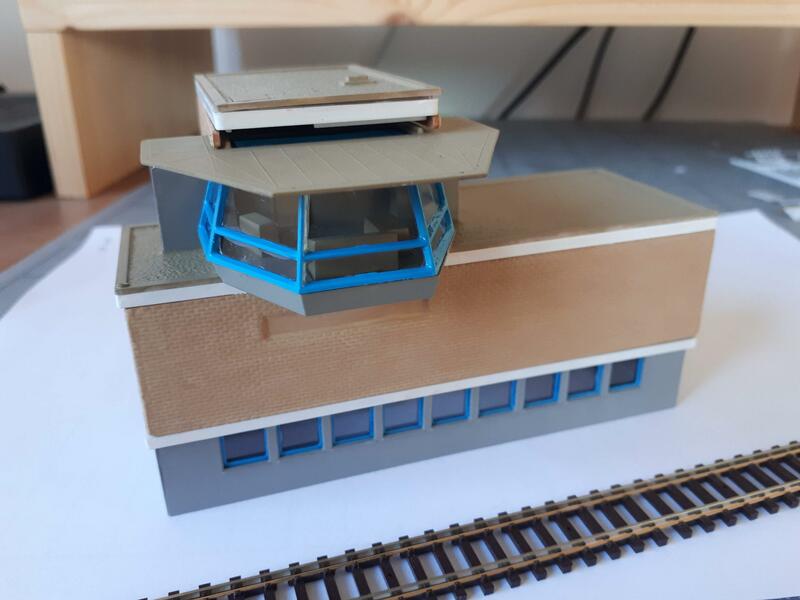 Here's my nearly finished signal box. I've painted it in my favoured colours with various mixes of Tamiya acrylics. …………. You appear to have made a good job of the signal box. I've built a couple of these kits over the years and they didn't fit together particularly well. Probably something to do with it being a very old moulding. 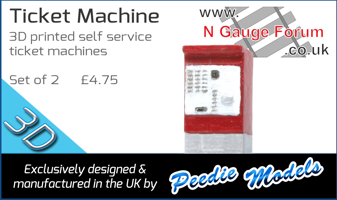 Regarding the station, I will be going for a scratch build...…….. I've located a small, modern station outside Zurich. I've sent a relative who lives near there to go and take photos for me! Now I know why you are using a Swiss station to model and not a German one. Thank you, yes the fit is a bit dodgy here and there but the overall effect seems good! Yes it's kind of him to go and take those research photos, would be a bit stuck with only street view as reference! 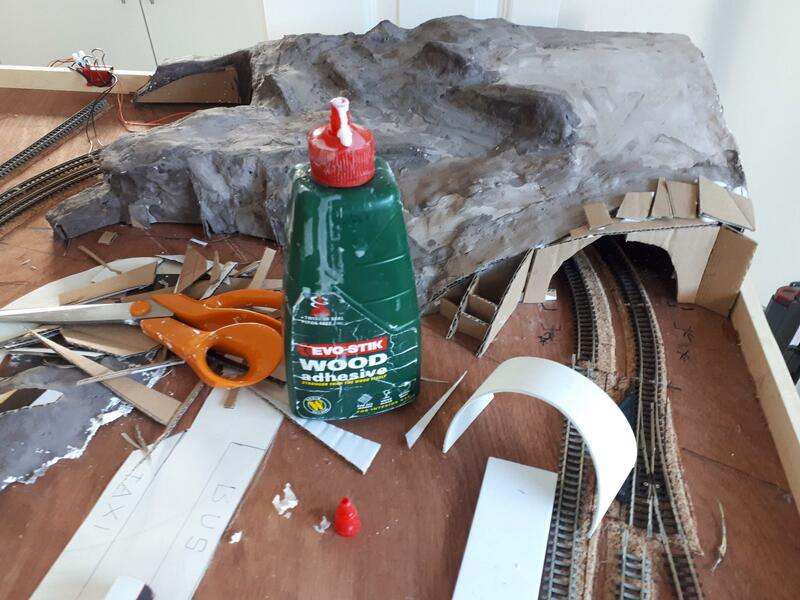 I've just started gluing the track down to the cork bed with PVA. I must say I'm quite surprised how much noisier the trains are running over the glued down sections! Is it any quieter if you use track pins/screws instead? 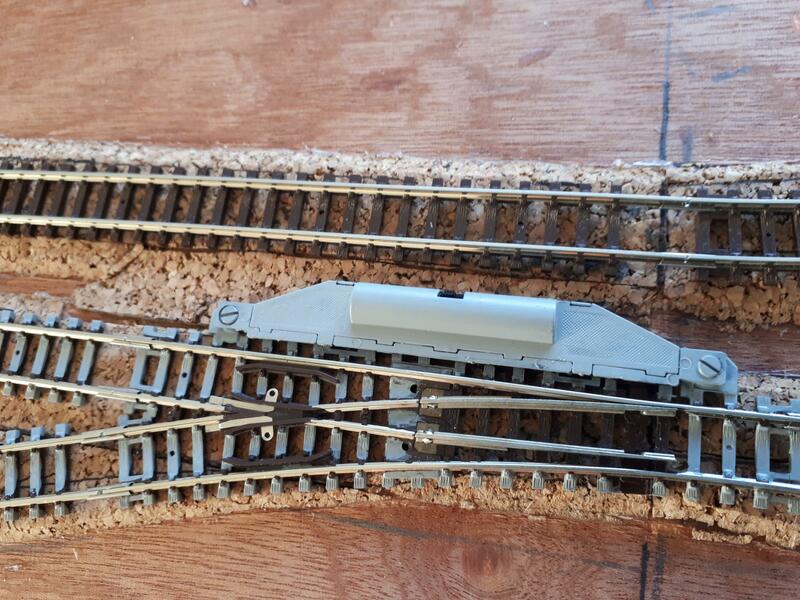 Pins and/or screws driven into the ply will increase the noise even more and if you think it is noisy now wait until you do the ballasting. Glued track will transmit more sound than loose track as you've created a firm contact between track and cork, and between cork and baseboard, but the cork itself at least provides some insulation compared to gluing track directly to the baseboard. Personally I think pins/screws transfer more sound to the underlying board, plus they look worse IMO. I agree completely with Nick. I have done a fair bit of testing as I like quiet trains. The best results for sound-deadening that I found is a soft-ish foam and track stuck to it with 'Copydex'. (The Table-Top Railway (Mk II) used this approach.) A single track pin through the foam and into the solid baseboard will increase the noise much more than one might think.